Constantine I spent comparatively little time in Rome before shifting the Empire’s capital in 330. Yet he left in the city a considerable architectural legacy. The meaning of Constantine’s monumental edifices is crucial to our understanding of late Imperial architecture. Amongst these is the Janus Quadrifrons in the Forum Boarium (c. 315 CE). 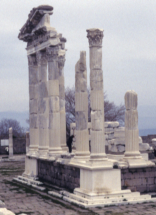 Long in a poor state of preservation, the Janus Quadrifrons – unlike other Constantinian structures – is often neglected by scholars. And yet study of the arch’s form, and inquiry into its function and cultic dedication, convey much about Constantinian architecture. The impact of local traditions and environment upon architecture’s meaning, and its modes of expression, are revealed. Dedicated by Constantine following his first entry into Rome, the Janus Quadrifrons offers a valuable insight into the new emperor’s attitude towards the city. And into how Constantine sought, through architecture, to ingratiate himself with the populace. From antiquity, the Dardanelles has been renowned as the site of the Trojan War. However, when Anzac soldiers landed at Gallipoli in 1915, this landscape also came to occupy the collective Australian imagination as a place of national origin. Sidney Nolan’s ‘Gallipoli Series’, painted between 1955 and 1975, employs the ancient memories of this landscape to better understand war as a concept. This paper will elucidate Nolan’s use of Homeric themes in the ‘Gallipoli Series’ and will examine the complex relationship between the artist, the Australian nation and the understanding of war. The paper will argue that the artist uses classical allusions to focus on the human consequences of the campaign, and highlight the devastating costs of war more generally. The paper will conclude that Nolan invokes the original Trojan conflict in the Dardanelles to distance his subject matter from the Great War and enable him to better understand war’s universal nature. A manuscript of Terence was produced at the abbey of St Peter’s in Ghent around 1030-50. This manuscript has been studied because of its artwork (it belongs to an important family of illustrated manuscripts of Terence’s plays) and its script, but not with respect to the scholarship it contains, which is mostly written as marginal notes. All records of St Peter’s abbey were either destroyed or widely dispersed during the Reformation, but careful study of the scholarship contained in the few surviving classical manuscripts, such as the Terence, reveals a vibrant intellectual culture, and provides important new insights into the transmission of classical texts in North-Western Europe in the post-Carolingian period. The biggest and most important museum collection of Cycladic figurines is housed in the National Archaeological Museum in Athens. This collection was the focus of my research trip to Athens, funded by the Classical Association of Victoria's inaugural Postgraduate Scholarship in Classics and Ancient History awarded in 2010. The major problem with this collection in Athens is that it does not have a comprehensive catalogue, despite its significance. This seminar explains the process of creating my own catalogue, in order to be able to give the necessary information in my PhD thesis. In particular it covers some of the more frustrating aspects of reconciling contradictory information given for Cycladic figurines in this collection from excavation reports and later publications. It is widely agreed that, in the re-emergence of Platonism as a dogmatic school of philosophy following the demise of the sceptical academy, Plato’s works came to have an authoritative status. This paper argues for a particular understanding of what that authority consists in and how it was acquired. In short, Plato's works acquired the kind of authority that works at the centre of a textual community have (cf. Stock, 1983). Not just any text can serve as the foundation for a textual community -- particularly a community of philosophers. The identification of the Platonic telos as 'assimilation to god' provided the re-orientation to the dialogues that permitted them to fulfill this role. Phoenician trade in the Mediterranean region during the Iron Age was governed by maritime expertise and the access this gave to raw materials, craftspeople and markets. This may not have been possible had suitable landing places and negotiation with indigenous people not been carefully observed. The Mediterranean winds and currents defined the suitability of routes, times and speed of voyages, however tidal activity, shallow waters and low-lying shorelines, germane to certain areas have hitherto not been considered as an important contributor to the location of Iron Age Phoenician settlements. This paper suggests that a significant knowledge concerning the activity of tides and associated coastal topography may have caused the Phoenicians to seek out specific locations as early landing sites and later settlements. If so, this in conjunction with indigenous co-operation may have been a major factor in their pre-eminent position regarding maritime trade in the Mediterranean region. For a thousand years the maintenance of the cura annona, Rome’s grain supply, was a pre-eminent issue for those in charge of the city of Rome. The control of the grain supply came to be seen as an important source of power and influence amongst those seeking to rule Rome. From the mid 5th century CE a number of solutions to securing the grain supply, and thus political stability, were attempted. These actions largely reflect the ambitions, failures and successes of the men who proposed them and the changes they made to the administration and government of the city and the Empire. The central Ionian Islands (Zakynthos, Kephallonia, Ithaca, Lefkas and Meganisi) form a close group at the end of the Corinthian Gulf, running in a chain from the northern Peloponnese to southern Epirus. Despite their physical proximity, their cultural and political histories, and the patterns of connection between them, are very varied. They thus form an ideal test ground for many ideas about insularity and island life, considering also the impact of their physical geography and of the wider political contexts to which they belonged (from independent city-states to federations and empires). Exploration of these islands – and Ithaca in particular - has long been focused on Homer, with the quest for the palace of Odysseus dominating archaeological research. But after many years of relative neglect of other periods and questions, the past two decades have seen a renaissance with new survey projects conducted on all of these islands, many rescue excavations, and programmes of scientific analysis. A comparable growth in research in the neighbouring areas of Akarnania, Epirus, and the islands of Paxoi and Corfu gives a rich new context in which to interpret the resulting data. Roman mercantile occupations are well-represented in the epigraphic record, as are other occupations related to the trade industry, but what sets them apart is the extra information that is supplied about their trading careers. Such changes in habit might be traced to specifying a locality to denote personal affiliation, or even trading preferences. However, it is the naming of commodity types, appearing somewhat like a ‘cognomen’ to their occupational title of negotiator or mercator, that is particularly interesting. These detailed professional titles suggest a specialized business preference. The variety and frequency of such ‘advertised’ specialization reached a peak in the high empire, but it remains clear that not all traders became specialized. It will be argued that, along with other career information, these details served to provide a public identity for these traders that reflected the reality of their intense economic environment. The best known queen of pharaonic Egypt is Nefertiti. She has been known to the world, not since the discovery of her famous bust in 1912 at Amarna, but since it went on show in Berlin in the early 1920s. At the same time English excavations there found evidence which began a series of fantasies and just plain erroneous hypotheses about her, with suggestions to rival the factional view of Roman politics and straight-out distortion of evidence. Since 1973, however, a totally new picture has been emerging - not that fantasy is in any way reduced. How can all this be sorted out ? Where exactly are we in understanding this remarkable woman ? Julius Caesar questioned the lawfulness of executing Catiline’s accomplices, although his objection was couched in terms of expediency. Were the killings lawful? If not, by what and whose standards? The sources for the debate are largely found in the records, or recreations, or inventions, of speeches made at the time. When were these documents composed, and for what purposes? Why did Cicero keep returning to this episode throughout the rest of his life, taunting Mark Antony in the Second Philippic, two decades later? What does the episode tell us about rhetoric in the late Republic? This seminar will report on the second stage of the Georgian-Australian Investigations in Archaeology (GAIA) project. It will focus on fieldwork carried out earlier this year at the site of Chobareti, in the Javakheti plateau, a verdant, mountainous region, bordering onto north-eastern Turkey. Our investigations, the first systematic fieldwork in the area, have begun to expand our understanding of a variety of highland cultures situated north of Mesopotamia, communities that deserve more attention than they have received to date. This presentation discusses some preliminary data obtained through research which is investigating sustainable, long-term management strategies for archaeological collections by analysing some of the problems experienced by archaeologists who excavate sites in the Near East. The research is part of a PhD doctoral research thesis (Fitzpatrick 2009-2013) which aims to develop an Archaeological Collections Management Plan with criteria to assist archaeologists in determining the research potential and significance of archaeological collections. It is underpinned by an ethical imperative upheld by most archaeologists which advocates that all archaeological data should be saved for future study and educational purposes since archaeology is a science grounded in basic research methods. The preservation and management of those archaeological data as a priority, constitutes ethical practice within the discipline of archaeology and responds to those fundamental tenets of science which rely on reinterpretation and repeatability of results. Few Argonautica studies are devoted to analyses of its supernatural elements. Yet Apollonius places these right in the full flow of the action; ships speak, enormous rocks move autokinetically, warriors grow from the earth, human figures are manipulated by gods and magic and so forth. Some would argue that such elements serve merely as hurdles to be overcome. In fact they are part of a deep complexity within the poem. They give expression to the important themes of animation and manipulation at key points of the narrative. In particular, they reveal vital connections and interactions between techne, nature and the human body. Through such connections, the supernatural takes its place in events alongside elements of regular status and is revealed as important and highly organic to the world of the poem. Richard Hunter is Regius Professor of Greek at Cambridge University (U.K.) and a graduate of the University of Sydney. His publications include commentaries on Hellenistic poets (such as Apollonius of Rhodes, Theocritus and Callimachus) and the ancient Greek novel. Professor Hunter's seminar is co-hosted with La Trobe University. In 71 BCE, the political career of M. Licinius Crassus gained rapid momentum as he secured both a privileged ovation and the consulship on the strength of his victorious command against Spartacus and his followers. Although the facts of his military operations against the rebelling slaves and their followers are quite well known, the precise nature of his official position as commander-in-chief in the Servile War continues to divide Roman historians. This paper will carefully revisit the extant sources in an attempt to produce a plausible solution to this problem. This year marks the 60th anniversary of Michael Ventris' announcement on the BBC (1st July 1952) that the language underlying the Bronze Age Aegean 'Linear B' script was an early form of Greek. Ventris' decipherment was a major breakthrough, complementing the archaeological investigations of the time by giving scholars access to the textual information recorded in the Linear B tablets about the socio-political, economic and religious facets of life in the Mycenaean world. This paper traces Ventris' key role in the decipherment of Linear B, alongside the significant work of Alice Kober, Emmett Bennett Jr. and John Chadwick. This seminar will focus on the extraordinary wanderings of Sebastian. As supreme commander of the Imperial West, Sebastian lost the struggle for power against Aëtius and was exiled in 434. Ten long years he was forced to reinvent himself as mercenary, freebooter and warlord, on an epic journey that took him from Africa, to Italy, Constantinople, Sicily, Gaul, Spain, and back to Africa. When imperial service was no longer possible, Sebastian had to hire out his services to the Visigoths, the aristocracy of Tarraconensis, and the Vandals. Special consideration will be given to his retainers – the notorious buccellarii - who provided Sebastian with significant military independence but also formed a source of social instability. His odyssey will be investigated to illustrate issues of naval power and piracy. Finally, Sebastian’s career will be used as a case study to clarify international relations between the various powers of the Late Roman World. The northern or continental part of Italy was known to the Romans of Republican times as Cisalpine Gaul, or as Gallia Togata - 'toga-wearing Gaul'. After the lex Pompeia of 89 BC, it was in the uniqe position of being a territory whose inhabitants were largely Roman citizens, yet who were under the sway of a Roman governor with imperium. This seminar will argue that this unique position was largely responsible for the curious fact that, despite being a largely peaceful province, Cisalpine Gaul was continually governed by consuls - the natural commanders of Rome's army. Since it was as governor of Cisalpine Gaul that Caesar crossed the Rubicon and so ended the Republic, this is a question of some importance in understanding the nature of the late Republican political and administrative systems, and the changing answer to the question: ‘what was a province’? The Roman military oath (Sacramentum) had been sworn by the army since the Republican epoch and survived well into the imperial era. But despite this longevity scholars know little regarding the oath itself, let alone its impact and effectiveness in the maintenance of military loyalty. This paper will seek to assess all aspects of the Sacramentum during the tumultuous period stretching from the accession of Maximinus Thrax in 235 up until the death of the Theodosius the Great in 395. It will seek to not only establish the form and content of the oath but also to assess its impact on the loyalties of the Roman army and its role in the wider context of the 'suite' of tactics used by the imperial power to maintain its unique relationship with the army. Our knowledge of ancient gardens is based on a combination of archaeological, iconographic and textual evidence, with the earliest reference being found in the third millennium BCE Sumerian Epic of Gilgamesh. Specific garden archaeology in the Levant has mainly dealt with later periods such as the Herodian period palaces at Jericho and Caesarea, botanical remains at Masada, the Hasomonean palaces of Hyrcanus I and Alexander Jannaeus, the palace garden at Tyrus (Iraq el-Amir in Transjordan), the Nabatean site of Petra and the recently discovered garden at Ramat Rahel in Israel. These sites have been approached more systematically and deliberately in regard to the recovery of physical garden evidence than most examples from the pre-Iron Age II, excavated during the 20th century, which tend to exhibit palaeobotanical evidence as a by-product rather than a deliberate result of excavation and to depend more heavily on architectural indications, themselves influenced by and interpreted in regards to biblical texts. This paper seeks evidence for sacred trees, groves or gardens at rural sanctuaries in the landscape of the pre-Iron Age II Levant and assesses their likelihood through examination of iconography, architecture, texts and palaeobotany. “Between Shochoh and Azekah” (Samuel 17:1) – What Do We Know About These Sites Even Before We Start Excavating Them? During the last three years the Tel Aviv University team conducted archaeological surveys, some small scale excavations, underground scanning and digital mapping of two of the most important sites in the Judean Shephelah: Azekah and Sochoh – the famous Biblical battlefield between David and Goliath. In this presentation, Prof. Oded Lipschits, the director of the Sonia and Marco Nadler Institute of Archaeology at Tel Aviv University and the head of the Lautenschlaeger Azekah Expedition, will present the first conclusions from this research and will describe the preparations for the first season of excavations at the site since 1899, which will begin on July 15th 2012. Professor Oded Lipschits is the Director of the Sonya and Marco Nadler Institute of Archaeology and Head of the Ancient Israel Studies program in the Department of Archaeology and Near Eastern Cultures at Tel Aviv University. He is also the Director of the Lautenschlager Azekah Expedition currently excavating the Biblically known site of Tel Azekah. Oded completed his PhD in 1997 with a doctoral dissertation on the 'Yehud' province under Babylonian rule (586-539 BCE) and now has a wide range of research interests from the Iron Age to the Hellenistic Period. He has won a huge number of awards and grants to go with a truly prodigious scholarly output including four books and many dozens of articles. Oded is married to Yael and they have four children aged from ten to twenty-three. Since 2009 the Koutroulou Magoula project, directed by Prof. Yannis Hamilakis (University of Southampton) and Dr. Nina Kyparissi-Apostolika (Greek Ministry of Culture), has undertaken an “archaeological ethnography” project alongside the excavation of the site. The archaeological site of Koutroulou Magoula is located near the village of Neo Monastiri (c. 250 Km north of Athens) and dated to the latter half of the Middle Neolithic period (c. 5800-5300 BC). This sub-project is examining a wide spectrum of socio-cultural implications for modern local communities. It was intended to implement a new praxis in archaeology by reframing the archaeological activities and incorporating other interests beyond only academic research. Through this approach, central elements emerged in our fieldwork activities: education, consultation and, most importantly, collaboration. However, the question is whether collaborative work can function on an archaeological project and how can we evaluate if a collaboration has been successful on an archaeological site?